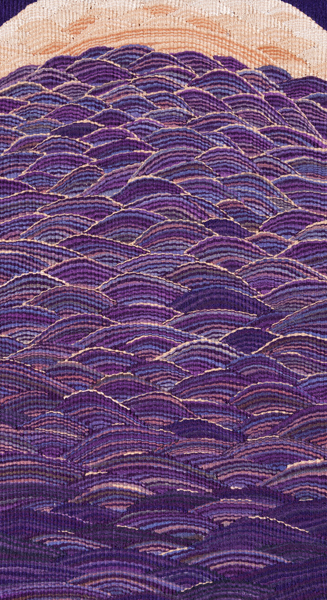 Julia found her passion for weaving tapestry in 1970, while studying textile design at the Memphis College of Art. She had the opportunity to study with a tapestry artist whose pieces and guidance taught her the limitations and infinite possibilities of this medium. Since then continuously adapting size and scale have become important to Julia in refining her style, all the while maintaining her fascination with pattern and repetitive shapes that occur in our natural landscapes. Also important in her work is the way she uses the effects of time and weather as a dominant part of her theme. Part of this adaptation has developed into smaller scale pieces that bring a much more intimate experience to the viewer. Julia’s work has been exhibited nationally, won awards, and commissioned for corporations and private residences.